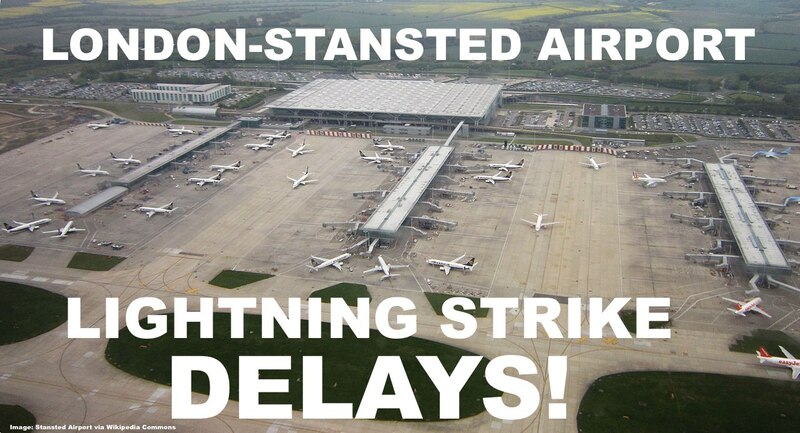 Lightning Strike Causes London-Stansted Airport Disruption, Hour Long Delays Expected – Watch Your Flight Status! As thunderstorms and torrential rain swept across the UK overnight, London-Stansted Airport suffered a lightning strike disabling many systems including the fuel supply for all aircraft. The system outage caused numerous delays, some of which are still ongoing. Departing passengers should check their flight status prior to going to Stansted Airport. Stansted Airprot is a base for a number of major European low-cost carriers, being the largest base for low-cost carrier Ryanair, with over 130 destinations served from there. Easyjet also facilitates STN for their London traffic. BBC reports (access here) that the airport was paralized by a lightning strike in the morning hours that disabled several vital systems required for airport operations. Flights have been cancelled or delayed and some are being diverted away from landing. The airport said its aircraft fuelling system was “unavailable” for a period earlier due to a lightning strike. A spokeswoman said engineers had since restored the system but “flights may be diverted, delayed or cancelled”. “We apologise for the inconvenience and advise all passengers to check with their airlines for their latest flight updates,” she said. Passengers have described being stuck on planes for hours waiting to take off, while others are waiting in an already crowded departure lounge for information. The problems occurred as thunderstorms and torrential rain swept across the UK overnight during the Bank Holiday weekend and at the start of school half-term. 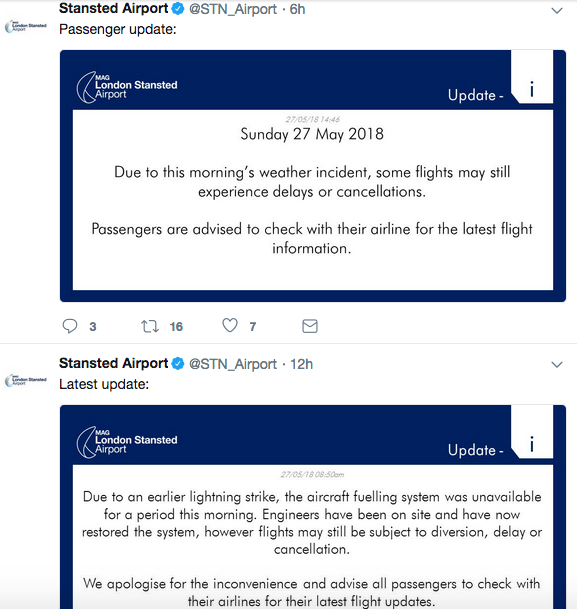 A number of flights have regrettably been cancelled at Stansted Airport this morning due to an earlier airport fuelling system failure, caused by a lightning strike. All affected customers have been contacted by email and SMS and advised of their options of a full refund, a free transfer on to the next available flight or a free transfer on to alternative routing. We apologise to all customers affected by these disruptions, which are entirely beyond our control. Airlines are obligated to accommodate passengers even in circumstances of force majeure, however if indeed all the flights are sold out in the coming days then there is very little the carriers can do. Budget carriers don’t rebook passengers to mainline airlines even though that’s a controversial practice that goes against the EU Regulation. I suggest to monitor the flight status of the individual trips but passengers whose flights were just delayed and not cancelled are probably in the best situation out of all affected. Next articleUPDATE: Be Careful With Duty Free Limit When Bringing Alcohol To Thailand – 75,000 THB Fine!